Some of the main causes of excess algae are too many fish for size of the pond because excess fish waste can feed algae as will over feeding your fish as the food waste decays and feeds algae. 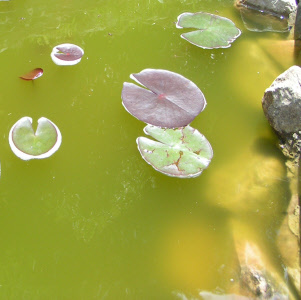 Pond plants can absord nutrients that feed algae so having a good coverage of pond plants is beneficial. Make sure you allow beneficial colonies of bacteria to build up on rocks, bio filters and the gravel in the pond. Over cleaning a pond can cause more harm than good by greatly reducing the beneficial bacteria growing on the filter mats, bioballs and lava rocks. Too much sunlight can exacerbate the issue of filamentous algae, this can be helped by adding plants. Fertilizers used in plants around the pond can wash into the pond with rain and runoff. The two types of algae that most pond owners and water gardeners experience are the suspended planktonic algae that makes the water greenish and the string algae that often grows in warm stagnant areas around rocks and in waterfalls. Planktonic algae consist of millions of microscopic algae floating throughout the water. This causes the water to turn green or “pea soup” color. Filamentous algae or string algae forms long and short hair-like strands. It attaches itself to rocks, gravel, plants, or any surface area it can find in the pond. While algae is different from more traditional pond plants, they are still plants, and just like other plants, algae require the same elements to grow: sun, food and water. The best way to fight algae is ensure proper conditions in the water, reduce the sunlight and available food using proper filters, pumps and algae control products. Algae can help balance the food chain ponds but all it takes is a slight shift in balance and algae can start to take over. Using beneficial bacteria and products like Pond Balance, D-Solv9 and Biological Clarifier are good ways to quickly restore a pond. Barley straw extract and pellets are also good natural sources of algaecide that will not harm fish and wildlife. Algae in ponds can leave the water green or cause filementous strands to form on rocks, waterfalls or even float on the surface. Maintaining proper filtration is key to keeping water clear. The build-up of fish food, leaves, muck and any other organic waste can cause algae to form in ponds. There are a range of specialized treatments that can be added to water to help control and eliminate existing algae. The ionizer systems are effective and easy to install and they simply connect to your existing pump system and release ions into the water which keep waters from turning green. Oxygen based algaecides can be sprinkled on algae matts and waterfalls and will quickly eliminate hairlike algae strands. UV clarifiers are very effective at keeping water clear but adding products to combat problem algae is often required. Algae control for filamentous algae in ponds in Canada. String Algae is a problem that affects most ponds, the rapid growing filamentous stringy algae can spoil the appearance of the pond. It will also clog pumps and filtration equipment. Pond Balance makes key nutrients unavailable to algae prev..
ProFix® - Complete Pond Cleaner Contains A 9% Solution For Rapid Action. ProFix is the new name of the popular D-Solv9 and has the same formula and, like D-Solv9, clears pond water regardless of color and removes suspended organic debris. ProFix® is formulated to be stronger, work faster and more.. Restore pond clarity, water quality and pond balance with Pond Logic® PondClear™. PondClear™ contains specialized strains of beneficial aerobic bacteria that digest organic debris that cause decreased water clarity, muck accumulation & pond imbalance. Clean, Clear, Healthy & Balanced..
D-Solv9® - Complete Pond Cleaner Contains A 9% Solution For Rapid Action. Clears Pond Water Regardless Of Color and Removes Suspended Organic Debris. D-Solv9® is formulated to be stronger, work faster and more economical per treatment than any similar product on the market today. Use D-Solv9® in ..
CrystalClear® OneFix™ utilizes natural bacteria to digest suspended dead organics to help keep the pond balanced and the water crystal clear. OneFix™ is specifically designed to start working the second it hits the water. Use once every two weeks when water temperatures are above 50°F.Ideal for C..
D-Solv will help remove attached algae from waterfalls, streams and rocks in minutes. We find D-Solv™ works best as a spot treatment for eliminating algae from waterfalls, simply turn off your pump, sprinkle D-Solv on the areas with algae and let it sit for 15-20 minutes then turn your pump back .. The CrystalClear® EcoPack™ brings together the best of the best from CrystalClear® into one package designed to keep your pond crystal clear all season long! This easy-to-use pond care program fights common pond problems such as algae, murky water, unwanted muck and debris on rocks, streams and w..
Control and eliminate pond algae using this algaecide. Polypro® alagecide is diluted and sprayed onto pond algae to quickly kill algae. If the algae problem in your pond has reached a level that requires immediate action then Polypro is the solution. This algaecide was designed to work in pot..
Special Order: Allow 2 - 3 weeks delivery time. Control and eliminate pond algae using this algaecide. 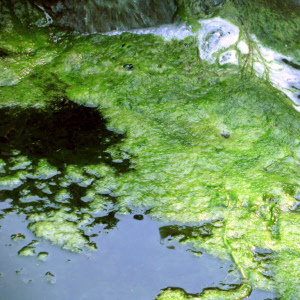 Polydex® alagecide is diluted and sprayed onto pond algae to quickly kill algae. If the algae problem in your pond has reached a level that requires immediate action then Polydex is t.. The IonGen™ second-generation electronic water clarifier for ponds, pondless waterfalls and other decorative water features drastically reduces maintenance and provides crystal clear water without the use of chemicals. A microprocessor inside the IonGen releases ions from a scientifically blended..
Atlantic is pleased to introduce the new Triton™ Ionizer 3 to control string algae and green water in water gardens, fish ponds and pond free ponds. This low voltage water management system electronically introduces microscopic ions of copper, silver and zinc into the water which control organic ..
Aqua UV Classic™ Ultra Violet Filters for ponds. The Classic Series UV’s are ideal for ponds, aquariums, and water features. The Classic’s rugged design has features that allow for quick installation and easy maintenance. Aqua Ultraviolet UV’s will clear your water in 3 to 5 days sometimes .. The submersible UV Clarifier from Pondmaster® allows pond owners to add ultra-violet filtration into any sized pond with ease. Because it actually sits in the pond and is completely submersible you won't need to install any extra exterior mechanisms and only need to add some tubing from your pump..